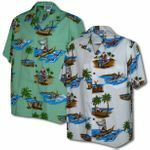 MauiShirts offers the largest selection of Santa and family Christmas clothing. Happy Hanukkah ~ Hau'oli Hanukaha (pronounced how-oh-lay ha-new-ka-ha). New Christmas shirts are created by many Honolulu and imported shirt makers every year. Here is an interesting piece I found on the History Channel web site. It was copied from their History of Santa Claus and Christmas. "The legend of Santa Claus can be traced back hundreds of years to a monk named St. Nicholas. It is believed that Nicholas was born sometime around 280 A.D. in Patara, near Myra in modern-day Turkey. Much admired for his piety and kindness, St. Nicholas became the subject of many legends. It is said that he gave away all of his inherited wealth and traveled the countryside helping the poor and sick. One of the best known of the St. Nicholas stories is that he saved three poor sisters from being sold into slavery or prostitution by their father by providing them with a dowry so that they could be married. Over the course of many years, Nicholas's popularity spread and he became known as the protector of children and sailors. His feast day is celebrated on the anniversary of his death, December 6. This was traditionally considered a lucky day to make large purchases or to get married. By the Renaissance, St. Nicholas was the most popular saint in Europe. Even after the Protestant Reformation, when the veneration of saints began to be discouraged, St. Nicholas maintained a positive reputation, especially in Holland."